News — Denton's premiere provider of hearing health care. Denton's premiere provider of hearing health care. Preferred Hearing Care, Denton TX. Keep up with our news and find interesting hearing aid, testing, and informational articles here! A better quality of life awaits once you overcome the myths surrounding hearing loss and its treatment. If you suspect you have hearing loss or you know someone who does, schedule an appointment today! When you think of hearing loss, diabetes probably isn’t the next thought that comes to mind. There are many other diseases and conditions that are well-known as potential causes of hearing loss: Meniere’s disease, otosclerosis, excessive noise and aging. But research has shown that people with diabetes are twice as likely to have hearing loss, and considering how common diabetes is in the United States, it’s a statistic worth paying attention to. "Hearing loss may be an under-recognized complication of diabetes. As diabetes becomes more common, the disease may become a more significant contributor to hearing loss," said Catherine Cowie, Ph.D., of the National Institute of Diabetes and Digestive and Kidney Diseases, in a press release from NIH. "Our study found a strong and consistent link between hearing impairment and diabetes using a number of different outcomes. "A 2008 study published by the National Institutes of Health (NIH) examined two groups of people, one with diabetes and one without, that mirrored the national incidence of the disease. Researchers found mild or greater hearing loss of low- to mid-frequency sounds in 21 percent of the 399 adults with diabetes, as opposed to 9 percent in the 4,741 adults without diabetes. High frequency hearing loss was present in 54 percent of diabetics, compared with 32 percent of non-diabetics. The trend applied to pre-diabetics as well. The study found those with pre-diabetes (meaning those who are on the cusp of developing full-blown diabetes) had a 30 percent greater chance of developing hearing loss than those with normal blood sugar levels. While the exact cause is still uncertain, experts believe high blood sugar levels could damage the nerves and blood vessels of the inner ear in the same way they damage the eyes or the kidneys. In diabetic retinopathy, or blood vessel damage to the eyes caused by diabetes, vessels can swell and leak fluid, or new unnecessary vessels can develop within the retina. Advanced retinopathy can cause blindness. In the kidneys, blood vessels act as filters to strain out waste. Too much glucose puts more pressure on these filters, and eventually causes them to break down and leak fluid. 30 million Americans have diabetes, and 34.5 million have some form of hearing loss. According to the American Diabetes Association, 30 million Americans have diabetes, and 34.5 million have some form of hearing loss, which makes them two of the most prevalent health concerns in the country. Understanding the risks associated with both diabetes and hearing loss is important in preventing any further complications from occurring. If you have diabetes, or pre-diabetes, be particularly conscious of the fact that you could be more at risk for hearing loss. Familiarizing yourself with the symptoms of hearing loss and scheduling routine hearing check-ups with your hearing health practitioner could help you catch hearing loss before it progresses too far. Further research published in 2012 in the Journal of Clinical Endocrinology & Metabolism reinforce the NIH’s previous findings. Studies of about 20,000 individuals across the U.S., Australia, Brazil and various parts of Asia found links between diabetes and hearing loss. While the prevalence of diabetes is on the rise, certain types of the disease can be prevented or even reversed. According to WebMD, most adults in the U.S. have Type 2, or adult-onset diabetes. There are many causes of Type 2 diabetes, but significant risk factors include obesity, poor diet and a sedentary lifestyle. Taking steps to improve your overall health lowers your risk of this chronic condition. Have your hearing checked once a year, much like an annual physical. While your primary care physician checks all of your vitals at a yearly physical, most do not administer a hearing test, or even ask if you’ve been experiencing any problems with your hearing. Chances are, you'll need to be proactive. Diabetes is a serious medical condition that you will manage with the help of your doctor. Being able to communicate with your medical team and hear the answers to your questions will help you get the most from your treatment plan. Hearing loss affects more than 48 million Americans and is the third most prevalent chronic health condition facing older adults. Although digital hearing aid technology is often the recommended treatment for the majority of sensorineural hearing loss cases, less than 20 percent of those who would benefit from treatment actually seek it. Those who do wait an average of 10 years to seek it; most wait until they cannot communicate in even the best of listening situations. Just like fastening your seat belt, good hearing is important for your safety. Those facts are concerning enough yet they’re even more disturbing when you learn of the other health and safety issues that can occur if you don’t address your hearing loss in a timely fashion. Results from a study conducted by the National Council on Aging reveal significantly higher rates of anxiety, depression and social isolation in older adults with untreated hearing loss. Older adults with chronic depression are more likely to develop poor eating habits, have higher rates of insomnia and memory loss and increased mortality rates. The good news? These psychological conditions improve with the use of hearing aids. Older adults who wear hearing aids are more likely to participate in social activities than those who do not. Relationships at home and at work, mental health, self-confidence and sense of safety improve with hearing aid use. Our brain is highly involved in our sense of hearing. Although our ears collect sound from our environment, it’s actually our brain that is responsible for helping us understand it. When this auditory pathway is damaged by hearing loss, the brain begins to atrophy. Researchers believe this increases the risk for developing debilitating health issues such as dementia and Alzheimer’s disease. Research conducted by Dr. Frank Lin, M.D., Ph.D., and his colleagues at Johns Hopkins University discovered individuals with mild hearing loss are twice as likely to develop dementia as those with normal hearing. The risk increased to three times more likely in those with moderate hearing loss and five times more likely for those with severe hearing loss. Fortunately, scientists have discovered that cognitive function in almost half of mildly impaired patients with dementia improves with amplification. Research by M. Kathleen Pichora-Fuller, a psychologist from the University of Toronto, is testing the hypothesis that treating hearing loss with cochlear implants or hearing aids in those with dementia will make it easier for them to listen so they can spend more of their energy performing more cognitively demanding tasks. Even if you don’t have dementia or Alzheimer’s, you might be interested to know those who treat their hearing loss with amplification benefit in memory-related testing. Because hearing loss-related brain atrophy occurs in the areas of speech and sound, hearing healthcare professionals recommend you seek treatment as soon as possible, before structural changes in the brain take place. Another study by Dr. Lin of John Hopkins University and Dr. Luigi Ferrucci M.D., Ph.D., of the National Institute on Aging discovered those with mild hearing loss — a 25 decibel (dB) hearing loss — were three times more likely to have a history of falling. With every 10 dB of hearing loss, the risk for falls increased by 1.4 percent. Lin said gait and balance are very “cognitively demanding” — as is hearing loss. That means when the brain is required to spend extra energy compensating for hearing loss, it has less to expend on gait and balance. Untreated hearing loss can be dangerous to your personal safety, too. If you can’t hear well, you may not respond to important danger signals. This can be problematic at home if you can’t hear the smoke detector or community tornado siren. When you’re driving, you may miss hearing railroad crossing warnings or fire and police sirens. Not only is reduced alertness dangerous to your personal safety, it may also impact those you love. Treating hearing loss can improve your overall awareness as a driver — which impacts those who travel with you as well as others on the road. Being able to hear smoke detectors is also critical to keeping your family safe. Studies have shown that regular smoke detectors which emit a high frequency sound are not always effective at waking those with hearing loss. Instead, those with mild to moderate hearing loss are more likely to be awakened by smoke alarms which emit low-frequency alarm sounds. Now that you’re aware of just a few of the health and safety risks posed by untreated hearing loss, consider making an appointment with us right away. No matter your age, having your parents in your life is a blessing. For Generation X and Baby Boomers whose parents are aging, this is even more so. However, this blessing can sometimes come with having uncomfortable conversations with your parents about unpopular topics such as when it’s time to stop driving or living independently, when it’s time to get that second medical opinion or when it’s time to get help for a hearing loss that is causing communication breakdowns. Nobody wants to throw in the towel and admit they can’t do things they have always enjoyed. Not only that, but most parents and their children dread the day when their roles may be reversed – when the adult child is faced with becoming a caregiver for their aging parents. Much of the turmoil surrounding this time for aging adults is rooted in a fear of losing their independence. Having an untreated or ignored hearing loss may not seem like the most pressing difficulty facing your aging parents, but it can have a big impact on their health and safety. Operating a vehicle without begin able to hear emergency sirens or other drivers honking can cause accidents. Not being able to communicate effectively with multiple medical professionals and specialists can result in instructions not being followed and dangerous misunderstandings. Further, it's been shown that when you have an untreated hearing loss, your medical expenses for other conditions increase. Even navigating public transportation with a hearing loss can be frustrating and can discourage your folks from leaving home to run errands or visit friends. Studies have shown that when hearing loss is ignored, it can hasten cognitive decline. Not being able to hear means your parents will have a harder time connecting with others which leads to social isolation, feelings of helplessness, and low mood. They may stop doing many of the things they once enjoyed. Even your own interactions with your folks may become strained due to their hearing loss, and this is no way to spend your precious time together. If you’re ready to broach this difficult topic and tell your parents it's time to get hearing aids, there are right and wrong ways to go about it. Here are some tips for success. Do your homework – Take time to research the basics of hearing loss and hearing aids. If your parents have limited knowledge, they’ll appreciate that you are a few steps ahead of them. If they already know a lot about hearing loss treatment, you’ll be able to have an intelligent discussion if you know the basics. Healthy Hearing is the perfect place to learn about hearing loss through our extensive library of help pages and downloadable consumer guides. Timing is important – Avoid talking about hearing aids with your parents during times when they may feel stressed out about other things or are at maximum frustration with their hearing loss. Wait until you have some peaceful alone time with them. Turn off the television and silence your phones so you won’t be interrupted. Be empathetic and loving – First, try and put yourself in their shoes. After all, many years down the road, you may be the one on the receiving end of this difficult conversation with your children. You want them to get help for their hearing loss because you want the best for them. Don’t lose sight of your good intentions if the conversation isn’t going the way you hoped. Focus on the effects – Rather than talking incessantly about the hearing loss itself, which could cause your mom or dad to become defensive, focus on how the hearing loss is affecting your lives. You might tell them that you are sad to see they don’t enjoy playing bridge anymore or going to the theater as they once did. You might mention that they seem tired and frustrated more often because listening with hearing loss is much harder than with normal hearing. You might even tell them how much their young granddaughter misses being able to talk to them on the phone. Ask them to open up to you about other challenges the hearing loss is causing. Partner up – To the extent they want help, offer it. The beginning of a new journey with hearing aids can be daunting with so many product choices, confusing hearing aid advertisements, and technology that can be difficult to understand. Help Mom or Dad find a hearing care professional close to home, and offer to go to their appointments with them. It’s useful to have a second set of ears at these appointments since there will be a lot of information to digest, and you can help your parents sort through it. Finally, if you are in the fortunate position to be able to help your mom or dad pay for their new hearing aids, consider that your help could be just the push they need to take the next step. Hearing aids are expensive, and they are not covered by Medicare. Price alone is one of the most common reasons why people don’t buy hearing aids. Be an advocate – If you succeed, and Mom or Dad ends up with new hearing aids, that’s wonderful. But, new hearing aids are only the beginning of the better hearing journey. Adjusting to new sounds and getting used to handling hearing aids isn’t easy for everyone. You can be a valuable resource for your folks by practicing hearing aid care with them in between their follow up appointments, talking about all the new sounds they are hearing and just being patient with their process. You can also be their champion with the rest of the family so everyone understands how best to communicate with your parents. As we grow older, we sometimes become less assertive about our needs and less willing to “rock the boat.” If the hearing aids aren’t working properly or if your parent isn’t satisfied, be a liaison between them and their hearing care professional. Don’t let their concerns be ignored, or those hard-won hearing aids may end up in the junk drawer. Hearing aids are packed with amazing technology that improves people’s lives every day. However, the entire better hearing experience depends heavily on patients’ relationships with their hearing care professionals. After you discuss their need for hearing help, find a trusted hearing care professional nearby. In our directory, you can view profiles and even read candid reviews from patients. Hearing aids for your parents will be a gift for your whole family! It’s been said that listening and hearing are two different senses -- listening is a voluntary act while hearing is an involuntary process. Yet if you’re one of the millions of Americans whose sense of hearing has been damaged, your ability to listen can be profoundly affected, no matter how hard you try. Much like breathing and blinking your eyes, hearing is involuntary. Fully functioning auditory systems collect noise and funnel it to sensory receptors in the cochlea, where tiny hair cells busily translate pitches and frequencies into electrical impulses. From there these impulses travel along the auditory nerve to the brain where they are interpreted as recognizable sound. Listening, on the other hand, is a voluntary act requiring conscious attention. You can attend church and hear the pastor speak, but if you choose not to listen, you may not remember the sermon or its message. You can hear your wife when she’s telling you what to buy at the grocery store, but if you’re preoccupied with something else while she’s speaking, you may not remember what she said once you get there. Active listeners not only hear what sounds their ears are collecting, they also choose to pay attention to what their brains are processing and apply the meaningful content to the situation. The process makes it easier for them to remember, recalling relevant information when it is needed. Unfortunately, those with hearing loss often have difficulty processing speech, making it difficult to understand what is being communicated. In the case of sensorineural hearing loss (SNHL), which accounts for as much as 90 percent of all hearing loss, higher pitched tones sound muffled and it’s often difficult to separate the conversation from other noise in the room. For these individuals, staying engaged in the conversation can be so taxing, it can cause a condition known as hearing loss fatigue. Symptoms include exhaustion and low energy. What’s more, untreated hearing loss can also lead to increased irritability, anxiety, depression and a greater risk for developing dementia and Alzheimer’s disease. In a February 2016 issue of The Guardian, Frank Lin, an otologist and epidemiologist at John Hopkins University in Baltimore, said he believes at least 36 percent of dementia risk is related to untreated hearing loss. He and his colleagues have begun clinical trials to study if access to hearing aids could help fight cognitive decline. Lin’s research is funded by the National Institutes of Health. Fortunately, most individuals with SNHL benefit from wearing hearing devices, such as hearing aidsand cochlear implants. A February 2013 study conducted by researchers at Vanderbilt University of 16 individuals 47-69 years old with SNHL revealed that those using clinically-fit hearing aids had reduced listening effort and susceptibility to mental fatigue than those who were unaided. According to the National Institute on Deafness and Other Communication Disorders (NIDCD), hearing aids are useful in improving speech comprehension in those with SNHL. But don’t expect those new hearing aids to magically improve your listening skills. That takes patience -- and some practice. The goal is to be an active listener so the speaker knows you’re engaged and you can remember what was said long after the conversation has ended. Face the speaker and maintain eye contact. That means turning off the television or putting away your smartphone. Giving undivided attention is a sign of respect. Be attentive, but relaxed. While Schilling says there’s no need to “stare fixedly at the other person,” she says it’s best to be present and pay attention. Keep an open mind. Try not to judge or jump to conclusions. Listen to the words and try to picture what the speaker is saying. Instead of planning what you’re going to say next, create a mental picture of what the speaker is trying to convey. Don’t interrupt and don’t impose your “solutions.” Wait until you are asked before offering any suggestions. Ask questions only to ensure understanding. If you ask questions, make sure they pertain to the subject matter and don’t lead the conversation in a different direction. Try to feel what the speaker is feeling. Demonstrate empathy by mentally putting yourself in the other person’s place while they speak. Convey what you are feeling with facial expressions and verbal feedback. Give the speaker regular feedback. Show you understand by nodding or providing appropriate verbal understanding. Pay attention to what isn’t being said. Nonverbal cues, such as facial expressions and body posture, can give us additional information about how the speaker is feeling. And if these tips don't work? If, even after reading these tips, you still find yourself working and concentrating more than usual to stay in the conversation, it may be time to have your hearing evaluated by a qualified hearing care professional. Not only can they can evaluate how well you’re hearing and prescribe customized treatment for your degree of hearing loss, they can also provide the educational resources you need to communicate effectively with family, friends and colleagues. You've committed to your resolutions for the new year and packed up the holiday decorations for the long winter. In many parts of the country, you'll need a hat and gloves to accomplish outdoor chores. You may also need to pay special attention to your hearing aids as colder weather and the loud sounds emitted by equipment of the season can spell danger for your hearing and hearing aids. 1. Use your memory settings for noise reduction. According to the American Speech-Language-Hearing Association, prolonged exposure to noise at a level of more than 85 dB(decibels) can result in permanent hearing loss, and snow blowers and snowmobiles emit sounds louder than 100 dB. Since hearing aids amplify sounds in your environment, and you want to protect your hearing from further noise damage, adjust your hearing aids accordingly. Check with your hearing healthcare professional to see if your hearing aid has memory setting features. If so, ask them to program one for aggressive noise reduction. 2. Protect with earmuffs. Earmuffs aren't only for keeping your ears warm while you're skating on the neighborhood pond or ice fishing with your favorite nephew. Specialized earmuffs are available specifically for protecting your ears from damaging noise. Even if you already have hearing loss, further damage from noise is almost completely preventable by simply limiting your exposure. Noise reduction earmuffs are not just for winter. In fact, they will come in handy many times throughout the year. Whether you're using your noisy lawnmower in the spring, enjoying a fireworks show in the summer and taking in a football game in a noisy arena, earmuffs will keep the noise level safe. Depending upon the style you choose, expect to pay anywhere from $10 on up for earmuffs that reduce noise by as much as 30 dB. 3. Buy a pair of sweat bands. Summer isn't the only time hearing aid wearers need to worry about moisture damaging delicate hearing aid components. Some active wearers continue to work up a sweat outdoors while enjoying winter sports. You may also get caught outside during periods of heavy snow or freezing rain. To minimize the amount of moisture your behind-the-ear hearing aids are exposed to as a result of perspiration -- or precipitation -- during the winter months, invest in hearing aid sweat bands. These accessories are available in a variety of colors and sizes, with an average price of $20 per pair. Most of them are washable and slip on easily, acting as a moisture repellant and providing a wind screen for your microphone. If your hearing healthcare provider doesn't sell them, you can find them easily online. 4. Keep batteries dry. Hearing aid batteries are adversely affected by changes in temperature, so it's extremely important to keep the battery compartment free from moisture. Inspect your hearing aid before you turn it off at night, making sure to remove the batteries and wipe the battery compartment thoroughly with a soft, dry cloth before storing. 5. Purchase a dehumidifier. Extreme changes in temperature can cause condensation inside your hearing aids, which can keep them from functioning properly. Consider investing in ahearing aid dehumidifier if you haven't already done so. This inexpensive piece of equipment can help prolong the life of your hearing aids by safely and effectively removing moisture overnight as you sleep. Some even sanitize hearing aids during storage. Ask your hearing healthcare professional if this accessory can help you. Dehumidifiers range in price from $5 to $100 and can be purchased online, through your hearing care provider or in many drug stores. Treating hearing loss, on the other hand, is proven to help remove these key barriers by having a positive impact on relationships, reducing the risk of cognitive decline, and boosting optimism and confidence. Our new SoundThinking site interactively illustrates the correlation between hearing loss and mental sharpness, and is a good counseling tool for helping patients understand the value of treating their hearing impairment. Here’s some good news for those of us who have a hard time owning responsibility for our hearing loss -- there’s a calendar day on which it’s perfectly acceptable to blame someone else for our problem. someone else for your hearing loss! The first Friday the 13th of every year is Blame Someone Else Day -- a 24-hour pass during which we can point the finger at family members, inanimate objects and society in general as the cause for our befuddled hearing. What? You don’t how to pass the buck? Please -- allow me…. Yes, your teenage grandson really should stop looking at his smart phone and lift his head before he answers your question and, yes, it would be advantageous if your wife actually came into the same room before she started giving you information about your weekend plans. Go ahead -- tell them, nicely of course, they’re the reason you didn’t hear what they said. It is true that it's easier to have a conversation with someone who is standing right in front of you -- and who enunciates well. But just between you and me, did you know that speech discrimination is one of the first signs of a particular type of hearing loss known as presbycusis? According to the National Institutes on Deafness and Other Communication Disorders (NIDCD), presbycusis is age-related and affects both ears at the same time. The NIDCD says one in three individuals between the ages of 65 and 74 have some hearing loss, more than half over the age of 75 have trouble hearing. It’s one of the most common types of hearing loss affecting older adults, caused mainly by physical changes to the inner ear. Hey, parts wear out eventually, right? If your hearing healthcare professional determines you have presbycusis, chances are good that hearing aids will improve your ability to understand speech. But, you’re on your own when it comes to improving your family’s communication habits. Honestly, I’m on your side on this one. Newer restaurants have removed many of the soft-sided accouterments of days gone by -- carpeting, curtains, padded booths -- in favor of a trendy industrial hardscape with high ceilings and tile flooring. While all of this might be en vogue, it’s certainly not conducive to having a good conversation with a group of friends. Between the chairs scraping on the floor, reverberation and the clatter of tableware, it can be almost impossible to hear the person sitting on the other end of the table -- or in some cases, the one seated right beside you. While we’re on the subject, you might be interested to know this is another symptom of presbycusis. A 1990 study published on the National Center for Biotechnology Information (NCBI) website discovered that older adults, regardless of their degree of hearing loss, had more trouble understanding speech in situations where there was competing noise than did their younger counterparts. Fortunately, depending on the type and severity of your hearing loss, individuals with this type of hearing loss usually benefit from wearing hearing aids with speech-enhancing technology. The microphones in these devices focus on speech and minimize background noise. But don’t take my word for it. A 2014 study published on the NCBI website found that hearing devices significantly improved speech understanding for older adults with moderate, age-related hearing loss. It might be the television, the car radio, the computer, or even the chimes on that new-fangled appliance that sings when the cycle is finished. If you can’t hear it, it must not be loud enough, right? A long history of noise exposure may be the reason you feel the need to turn the volume up on your devices now since age-related hearing loss can be blamed in part on the noisy environments we grew up in. Many of us worked in noisy environments or served in the military where loud sounds were common. Loud sounds, whether they occur consistently over a long period of time or happen suddenly, such as an explosion, can kill or damage the sensitive hair cells of the inner ear. These hair cells are responsible for translating the noises our ears collect into electrical impulses and sending them along the auditory nerve to our brain, which interprets the signals as recognizable sound. Loud noise bends and breaks these hair cells so they are no longer able to send signals to the brain -- and the damage is irreversible. This type of damage to our hearing health is known as sensorineural hearing loss. A hearing healthcare professional can evaluate the damage and determine whether or not the remaining hearing can be enhanced with amplification. If you recognize yourself in one or more of these situations, chances are good that your hearing simply isn’t what it used to be. And, while you’re in good company with the other 48 million Americans who report some degree of hearing loss, blaming other people or even things for the problem isn’t going to make it any better. Untreated hearing loss is associated with a wide range of physical, mental and emotional issues ranging from circulatory problems like heart disease and diabetes to dementia and Alzheimer’s disease. In most cases, amplification can reduce these risks, but the average time a person with hearing loss waits to seek treatment is seven years after their diagnosis. That statistic is hard to believe since hearing aids have become smaller and more discreet in the last ten years, all but eliminating the stigma your parents and grandparents may have felt when wearing them. Not to mention, technology that's every bit as impressive as today's most sophisticated computers and small enough to fit in your ear, is reason enough to see what hearing aids can do for you. So today, go ahead and blame someone else for your hearing loss. Tomorrow? Maybe it’s time to own your hearing loss and schedule a hearing evaluation with a qualified hearing healthcare professional. If you don't know where to start, just click here. Hearing aids are expensive, no question. If you’ve recently been told you need hearing aids but hesitate to get them because of the cost, you're not alone. In fact, financial constraints are one of the top reasons why many consumers who need hearing aids say they will not buy them. But, you can purchase the hearing devices you need without breaking the bank, but it takes persistence and a little consumer savvy. First of all, have a frank conversation with your hearing center about your financial situation and ask if they offer any options for payment. Some may offer payment plans with no interest or very low interest that fit into your budget. Others may have their own foundation, designed to help patients who may not be able to afford the full cost of their devices. Some centers also collect and refurbish donated hearing aids from benevolent patients who are upgrading their devices. In some cases, these refurbished hearing aids may work for you. You can also ask your hearing care professional about any community-based programs which offer assistance. For example, Lion’s Club International supports a hearing foundation through some of their local organizations which provides recycled hearing aids to qualified low-income individuals who have been diagnosed with hearing loss and do not receive government assistance for their health issues. Another financing option is to apply for credit. Many card companies offer an introductory interest rate of 0% for new customers over a specified period of time. Be honest with yourself and determine how much each month you can afford to pay. If you can comfortably pay off the balance before the introductory period ends – and you qualify – it may be worth your while. 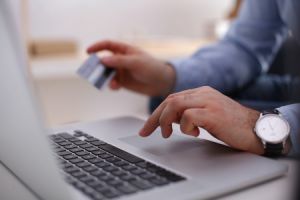 Sites like Credit Karma can help you identify which cards offer these introductory rates and find the right option based on your credit rating. Care Credit (Synchrony Financial) is one of the largest health, wellness and beauty credit cards in the nation, offering financing for cosmetic, dentistry, hearing, LASIK & vision, veterinary and other healthcare procedures. More than 175,000 health care providers accept Care Credit cards. The company typically offers a no interest option for purchases over $200 for terms of six, 12, 18 and 24 months. You can apply online or through participating healthcare professionals. Wells Fargo offers healthcare financing through their Wells Fargo Health Advantage credit card program which carries an annual percentage rate of 12.99%. Special terms include no interest if paid in full within six, 12 or 18 months, depending upon the amount of purchase. Qualified applicants can apply online and use the card at participating healthcare providers. If you’re still working, ask your employer if your health benefits package includes a flexible spending account (FSA). FSAs allow you to bank up to $2500 tax-free dollars each year to pay for co-payments, prescription medicines, deductibles and other out-of-pocket healthcare costs such as hearing aids. Most FSAs cover hearing exams and hearing aids, including purchase price, maintenance costs and batteries. Although the funds must be used during the calendar year, check with your employer to see if they allow any options to carry over a specified amount to the next year. Also, check with your plan administrator before you bank any dollars for a complete list of allowances as these may change from year to year. Do you own your home? If so, you may be able to use a home equity line of credit (HELOC) to finance your hearing devices. Much like a second mortgage, a HELOC is a loan you agree to pay within a specified term, using your home as the collateral. Interest rates will apply; however, the interest tax deductible. Check with your mortgage lender or bank officer to see if you qualify. The average cost of hearing aids can range from less than $1000 to $4000 per ear. If you think you’re saving money by not purchasing these medical devices, think again. Untreated hearing loss might actually cost your money and your health. In a recent study comparing the costs of healthcare for 562,000 privately insured individuals between the ages of 55 and 64, those with untreated hearing loss had medical bills which were 33 percent higher than those without hearing loss. Annie Simpson, assistant professor in the department of healthcare leadership and management at the Medical University of South Carolina and the author of the study, believes those with untreated hearing loss may avoid or delay going to the doctor due to communication difficulties. Those decisions may lead to a sicker patient who needs extended, more expensive, care. Research also tells us that untreated hearing loss can cause a variety of other medical conditions, such as dementia and Alzheimer’s disease, as well as increase anxiety, social isolation and depression. Hearing loss has also been linked to an increased risk of heart disease, falls due to balance issues, and personal safety due to an inability to hear warning signals inside and outside the home. Here’s the good news: research by the National Council on Aging indicates hearing aids significantly improve the social, emotional, psychological and physical well-being of those with mild to severe hearing loss. Patients in another study report at least one area of their life was improved by wearing hearing aids. Hearing aids are smaller and more discreet than they were even five years ago, and the technology makes it easy to connect to your favorite personal electronic devices. Now that you know hearing aids can be affordable and have such a significant positive impact on your life, it’s time to take action by finding a hearing healthcare professional near you. The sooner you begin, the sooner you’ll be hearing your best. And healthy hearing is hard to put a price tag on! It’s a noisy world. You’re part of it. And the numbers show that hearing loss is becoming more common among younger adults — in their 20s and 30s. So make sure you value your hearing. It's a treasure worth keeping. 3. It could boost your job performance. Most hearing aid users in the workforce say it has helped their performance on the job. That's right. Getting a hearing test could benefit all those employees (a whopping 30 percent) who suspect they have hearing loss but haven't sought treatment. Sometimes it’s just plain hard to face the reality of hearing loss. That’s probably why so many people put off dealing with it. But taking those first few steps is often the hardest part. We hope these tips will help people ease into acceptance and realize that addressing hearing loss really is one of the best things anyone with difficulty hearing can do to boost their quality of life. The copyright-free article is below. Please share it on social media, in your own newsletter, on your website, in your practice, and/or with your local media. Helping people address hearing loss really does make a difference in their lives. Thank you for all you do as part of the effort. We invite you to follow BHI on Twitter @better_hearing, and to like us on Facebook athttp://www.facebook.com/betterhearinginstitute. Life’s “To Do” list can be pretty daunting. And often, getting started on something is the hardest part. This can be especially true for addressing hearing loss. In fact, most people wait roughly seven years to do anything about it once they realize they have hearing loss. And that’s too bad — research shows that when people treat even just mild hearing loss, their quality of life goes up. Plus, when people with hearing loss use hearing aids, they get more pleasure from doing things and feel more engaged in life. Conversely, non-hearing aid users are more prone to feel down, depressed or hopeless, a Better Hearing Institute (BHI) survey found. They’re also more likely than hearing aid users to say they find themselves getting more forgetful. Groundbreaking studies, in fact, discovered that hearing loss is linked to cognitive decline and dementia. Add to that, BHI research showing that untreated hearing loss can take a significant toll on earnings — up to $30,000 annually. Luckily, the vast majority of people with hearing loss can benefit from hearing aids — which are now cooler, sleeker, smaller, more powerful, and work better than ever before. They’ve transformed dramatically, even in just the last couple of years. To help, we’ve put together five easy, achievable steps to get you started. The road to better hearing — and a better quality of life — is a single step away. 1) Take a convenient online hearing check at www.BetterHearing.org. BHI offers a free, quick, and confidential online hearing check you can take in the privacy and comfort of your home. A series of questions helps you determine if you need a more comprehensive hearing test by a hearing care professional. It’s a great way to get started — because you can ease into the possibility that it’s time to do something about your hearing difficulty. Useful information on hearing loss and hearing aid technologies awaits you on the site as well. 2) Visit a local hearing care professional. Hearing care professionals — audiologists, hearing aid specialists, and ENT’s (Ear, Nose, and Throat doctors or doctors of otology and otolaryngology) — are best-suited to help you. Audiologists and hearing aid specialists are expressly trained in all aspects of hearing aids and amplification, and are licensed by your state. Many work in practices with ENT doctors. They have the most appropriate and accurate equipment to give you a precise read on your current hearing level. And they can reliably counsel you on treatment options. Most important, going to a hearing care professional helps ensure that any underlying medical issue behind your hearing loss is identified and addressed. Simply, seeing a hearing care professional is your best safety net for proper diagnosis and treatment. The smartest thing you can do is to get it right the first time. And be assured, research shows that the great majority of people who visit hearing care professionals say they’re happy with the quality of service and counseling they receive. Most hearing care professionals even provide free trials so you can see what using hearing aids is like, with a minimal service fee if you decide not to keep them. 3) Information gather. Educating yourself helps you reach acceptance and peace of mind. Go to www.BetterHearing.org and learn what you need to know. Among other things, you’ll find: You can do this. You’re not alone. New, sleek and stylish, state-of-the-art hearing aids make it much easier to manage hearing difficulty without a lot of fuss. Many new hearing aids are virtually invisible; they sit inside the ear canal, out of site. Treating hearing loss means better quality of life and more effortless living for you. 4) Window shop. It’s OK to “just look.” You set the pace. Visit the “Hearing Aids Can Help” tab at www.BetterHearing.org. Opportunities to online window shop for hearing aids are right there for you. But most important, be up-front with your hearing care professional. Tell them you’re not ready to buy. But do let them know you’re ready to learn about the best hearing aid technologies for you if hearing aids are what they recommend, to get demonstrations on how they work, and to try them out at no cost or obligation. And remember, hearing aids are only sold by licensed hearing care professionals. True hearing aids that are designed to treat hearing loss and are cleared by the U.S. Food and Drug Administration (FDA) need to be fitted, adjusted, and tuned to your ears and specific needs, with appropriate follow-up. This is what makes leading-edge hearing aids so beneficial. So when you do seek out information, make sure you go to a hearing care professional. 5) Let it all sink in and make a plan. Consider everything you’ve learned and take time to think about it. But do give yourself a timeline for making a decision. If — after you’ve educated yourself about hearing loss and hearing aids — you decide to wait, set a hard date for re-evaluating your decision. Research shows that the sooner you treat hearing loss, the better it is for you and your quality of life. For more information on hearing loss and to take a free, quick, confidential, online hearing check to determine if you need a comprehensive hearing test by a hearing care professional, visit www.BetterHearing.org. Follow BHI on Twitter@better_hearing. Like BHI on Facebook at www.facebook.com/betterhearinginstitute. Hearing loss is a spectrum, and people with hearing loss don’t all communicate the same way. How a person communicates depends on a variety of factors, such as the person’s degree of hearing loss, whether a hearing aid or cochlear implant is used, the age the person lost his/her hearing, the level of auditory training received, and the nature of the listening situation. The majority of people with hearing loss do not use sign language, but it is still important to those whose communication depends on it. A person does not obtain “normal” hearing by wearing a hearing aid or cochlear implant. It is not the same as wearing glasses. Hearing aids increase the volume but do not significantly improve clarity or bring the sound closer to the person. Hearing ability in cochlear implant recipients varies from almost normal to only perceiving environmental sounds and depends on such factors as the individual’s hearing history, age of onset and length of deafness, and age of implantation. 4. People with hearing loss are have intellectual limitations and are unsuccessful. People with hearing loss have the same range of intelligence as the general population. People with untreated, or inadequately treated, hearing loss may respond inappropriately since they may have not heard what was said. Speaking to the companion of the person with hearing loss, instead of directly to the person, reinforces this attitudinal discrimination. Of the 48 million people with hearing loss, only 30% are 65 or older. It is frustrating to people with a hearing loss not to have something repeated when they miss part of the conversation. Saying, “It wasn’t important” compounds the frustration. No one should tell a person with hearing loss what is important. People with hearing loss may interrupt a conversation because they didn’t hear the speaker and not because they are rude. They may also position themselves toward the front of a group or in a room so that they are closer to the speaker, making it easier for them to hear and lip read. This is sometimes perceived as being pushy. Imagine being cut off from communication with your loved ones. Conversations happen around you but you can’t really participate, at least not like you used to. It becomes easier to just stay home than to try to go to a party or a noisy restaurant, because it is too frustrating to try and hear what your friends are saying. out on the most important moments. Seniors with untreated hearing loss report a lower quality of life than those without hearing loss or those whose hearing loss has been treated with hearing aids. The emotional factors involved are a significant part of the problem. To begin with, hearing loss adds to the perception that an older person is “slow” or losing their faculties, which is usually not the case. This negative perception from others can then lead to a negative self-perception, which in turn leads to lower self-esteem, frustration and even depression. The depression, anger and frustration of hearing loss do not operate in a vacuum, however. All aspects of life are affected by these negative emotions. Those who are experiencing age-related hearing loss quite often find that their family relationships suffer due to their inability to hear adequately or fully participate in conversations. A person with hearing loss might be irritable, and lash out at their loved ones out of frustration. Blaming others for mumbling or speaking too softly is common for those with age related hearing loss, as are arguments over the volume of the TV or radio .Another common source of tension is one spouse’s refusal to go to parties and social events because he is embarrassed about his hearing loss, and frustrated that he misses most of the conversations. Another unique problem faced by older people with hearing loss is that culturally, hearing loss is often written off as just a normal part of aging. True, age-related hearing loss, or presbycusis, is slow to progress; but because of its slow progression, seniors, their family members and their doctors are often slower to acknowledge hearing loss, and do not take it seriously. And even those who eventually do seek treatment are not in any hurry; the average amount of time between noticing hearing loss and seeking treatment is 10 years. Regular medical care isn’t helpful either; surveys show that only 14 percent of doctors make hearing loss screening a regular part of a physical exam. All of this adds up to an epidemic of untreated hearing loss for seniors. Hearing loss can also take a toll on the physical health of the elderly, whether in the form of diminished personal safety, disease or falls. Those with hearing loss might have difficulty hearing an alarm or a siren, or might not hear someone shouting a warning. They might not hear a doctor’s instructions regarding medication, or other vital medical information. And studies have shown due to balance issues, those with untreated hearing loss are 3 times more likely to suffer falls than those without. Healthwise, the social isolation that often accompanies hearing loss can also be detrimental. Those who are socially isolated are less likely to exercise and more likely to drink, smoke and have an unhealthy diet. These in turn lead to poor physical health in the form of conditions like diabetes, high blood pressure and heart disease. And social isolation due to hearing loss has also been linked to higher rates of cognitive decline in the elderly due to brain atrophy that accompanies a lack of use of the “hearing centers” of the brain. In short, hearing loss affects every aspect of life for seniors, from physical well-being to emotional health and family relationships. Fortunately the solution may lie in just one call to a hearing healthcare professional; seeking treatment for their hearing loss can help older people re-engage in life once again. There's no way around it – hearing aids are expensive. A recent survey published by the Hearing Review found that mid-range hearing aids average around $4,000 a pair and most insurance providers do not cover this cost. The high price tag is often a barrier to getting the help and hearing relief hearing aids provides, but it doesn't have to be. When it comes to cost, there's a lot to consider and keep in mind. Whether new or experienced, hearing aid wearers have many similar questions regarding hearing aid purchase; from how much hearing aids cost to whether or not insurance will cover them. Hearing aids are an important purchase; these are devices you'll be wearing most hours during the day, seven days a week. When buying hearing aids, it's essential to be sure the money and time spent is well worth it. There are often many services included in the price of a hearing aid. Ask your hearing care professional what is included so you fully understand what you are purchasing. As mentioned above, the purchase price of a single hearing aid is generally anywhere from $800 to $4000 per ear, so the total for two hearing aids, as most people require, ranges $1600 to $8000. The price of a hearing aid typically includes the cost of the hearing examination, the device consultation and fitting time (including post-fitting adjustments), follow-up appointments, cleanings and a device warranty that can range from one to three years. The warranty often covers all repairs and includes a one-time replacement policy if you lose the hearing aid during the first year. The price may also include a year’s worth of hearing aid batteries. Why is there such a large range of pricing for hearing aids? There are two main factors that affect the purchase price of the hearing aid: the style of the hearing aid and the technology of the hearing aid. The hearing aid style can range from devices that are small enough to fit completely in your ear canal or discreetly tuck behind your ear to larger devices that sit on top of the ear or fill up the outer part of the ear canal. Generally speaking, the smaller custom devices are the most expensive because of the labor and precision required to create them in the exact shape of your ear canal. All hearing aids have a basic level of sound processing technology that will automatically adjust for sound coming in and account for your hearing loss. The more advanced hearing aids have the best technologies available for feedback reduction, hearing in noise solutions, wireless capabilities and other features to improve the listening experience. Generally speaking, the more advanced the technology in a hearing aid, the more expensive the device. When you combine the user need for advanced technology in the smallest custom sizes, you will see prices along the higher range, and vice versa. think of how they'll positively impact your quality of life. Hearing aid pricing includes the cost of the device itself as well as the services from the professional. Much of the cost in manufacturing hearing aids is from the research needed to continue making technology advancements each year. Each year, hundreds of millions of dollars are spent by the industry to improve how these devices perform. This investment back into research ultimately benefits the person with hearing loss. When you purchase a hearing aid, the price often includes all of the professional services that go along with the fitting. Fitting hearing aids is a process that begins with a hearing evaluation and continues throughout the lifetime of the hearing aid. Your hearing ability may change, your hearing aid may need repair and you may have questions from time to time that you need answered. You are making an investment in the professional, as well as the hearing aid technology. Here’s another way to think about the price of hearing aids. An average pair of hearing aids is $4800 and they have a life expectancy of about five years. If you break it down, the hearing aids will cost you $960 per year, $80 per month or $2.66 per day. In other words, while the initial amount sounds high, the ongoing usage price is reasonable. Monthly, it is about what you would pay to get satellite or cable television. Daily, it’s less than the cost of a mocha at your favorite coffee shop. When you consider the communication, relationship and health benefits that you get from wearing a hearing aid, most people agree that it is well worth it. Why not buy hearing devices online or through mail order? You can purchase a lot of things cheaply online, including a ministry ordination and a medical degree. If you have a mild hearing loss, you may be tempted to buy a personal sound amplification product (PSAP) from a website. This product is similar to the eyeglass “cheaters” that you can buy at a corner drugstore. Unlike the glasses, which are easy to set up and adjust, hearing devices require some initial programming to fit your loss. The thing you don’t usually get with online hearing devices is a professional fitting. If you needed a hip replacement, would you order the parts online and try to place them yourself? In a nutshell: when hearing aids are fit with an appropriate, comprehensive protocol from a hearing care professional, you get more satisfaction and benefit from the hearing aids and you want to tell more of your friends about it. When hearing aids are fit with a minimal fitting protocol, you get less satisfaction and benefit from the hearing aids and you tell fewer people about it. In other words, you get what you pay for. Can I get financial assistance or insurance coverage to help pay for hearing aids? The most recent data have shown that about 40 percent of persons in the United States have some form of third party payment that helps to pay for hearing aids. Check with your insurance provider to see if you have a benefit and if so, the amount of that benefit. Most plans that include hearing aids cover only a certain amount of the aids (on average about 85 percent of the cost) every few years. If you have a served in the US military, you might be eligible for hearing aids through the Veteran’s Administration (VA). When you qualify, the VA normally pays for everything associated with the hearing aid, including a supply of batteries. There are other options for hearing aid funding, including low-interest loans for medical devices. Hearing aid dispensers work in a variety of settings from private practice to medical clinics to universities. Find a practitioner that you are confident can guide you along the journey. It’s also important to look for a practitioner who is geographically close to you and easy to access. The directory on our site includes clinic descriptions, staff biographies and patient reviews to help you find the right hearing center for you. One hearing aid costs about $2.66 per day or the price of a medium coffee. Another factor to consider is the financial impact of not spending that money on hearing aids. It is hard enough to put a price on the missed conversations with your spouse or the sounds you enjoy. However, if you are still working, you are losing money due to your hearing loss. A study by the Better Hearing Institute looked at over 40,000 households and found that untreated hearing loss reduced income on average by $12,000 per year and on the high end, up to $30,000 a year. The good news is that the use of hearing aids was shown to mitigate the effects of that by 50%. Not a bad return on investment. Most importantly, if you want to get the most out of your investment, you need to wear the hearing aids every day. The first few days will be long and tiring but your brain will quickly adjust to the new stimulation if you let it. Once you muster through the first week, you’ll be well on your way to hearing aid success! It's important to remember hearing aid pricing is only one factor when it comes time to purchasing a device. Your hearing aid purchase should be viewed as a long-term investment. In addition to your device, the price of a hearing aid generally includes fittings, adjustments, maintenance and the chance to establish a relationship with your hearing healthcare professional. So while pricing is important, there are numerous other things to consider before selecting a hearing device. Understanding hearing aid pricing and costs can be complicated. We hope you found this article helpful in answering some basic questions so that when you contact hearing care provider you will be better prepared. If you need to find a licensed hearing care practitioner in your area, be sure to use the Healthy Hearing Find A Professional section. It is as easy as entering your zip code to find the most information anywhere about hearing clinics in the US. Dispel these outdated beliefs before you decide whether to get hearing aids. 1. MYTH: Hearing aids are only for old people-or they'll make me feel old. 2. MYTH: Hearing aids are big, bulky, and unsightly. 3. MYTH: Hearing aids are only for people with severe hearing loss. "We hear with our brains, we don't really hear with our ears." 4. MYTH: I can't afford hearing aids. 5. MYTH: Hearing aids make everything sound too loud. 6. MYTH: Hearing aids can't help with my tinnitus. 7. MYTH: I only need one hearing aid because I only have hearing loss in one ear. 8. MYTH: Hearing aid salespeople are charlatans. 9. MYTH: Follow ups aren't necessary; they're just a way for audiologists to charge me more money. 10. MYTH: Hearing aids will work perfectly right away, like putting on a pair of glasses. 11. MYTH: If I don't like my hearing aids, I'm stuck with them. It's a big decision and I won't know if I'm making the right one until it's too late. (2) You value your relationships. (3) You like to be active. If you enjoy an active lifestyle, you’re not going to let untreated hearing loss stop you. Treating hearing loss means you have every intention of keeping up the pace of a fulfilling life. In fact, people with hearing difficulty who use hearing aids get more pleasure in doing things and are even more likely to exercise and meet up with friends to socialize, research by the Better Hearing Institute (BHI) shows. (4) You love living life. (5) You’re tech savvy and make the most of what modern life has to offer. PREVENTION AND TREATMENT Smartphone in hand, you turn the music blaring from your headphones down to half volume. Through this simple action, you have taken an important step to preventing noise-induced hearing loss. LISTEN UP: Over 48.1 million Americans have some kind of hearing loss. Approximately 15 percent of Americans between the ages of 20 and 69 have high frequency hearing loss due to exposure to noise during leisure activities or at work. Among children and adolescents age 6–19, 12.5 percent have suffered permanent damage to their hearing from excessive noise. With the rise in popularity of personal audio technology over the past decade, noise-induced hearing loss is a growing concern. Like other forms of hearing loss, noise-induced hearing loss is irreversible. However, unlike most hearing loss, noise-related hearing loss is completely preventable. The effects of hearing loss in children can be especially profound. Hearing loss can impact a child’s development and academic success and may even lead to social isolation. Turn the volume down. A good guide is half volume. Limit listening time. Give your ears a break. Model good behavior. Parents should demonstrate responsible listening habits. Comments or questions regarding this website? Click here to send us a message!